Today,Blogging has Become a source of Earning Money Online.Blogging is now turned into business that you can choose as a full-time carrier to earn money.Coming to the point that,After having a blog and Getting good traffic daily.The main thing come's in blogger's mind is monetization.But as we all know that Google Adsense is one of the best and highest paying advertising network and majority of Bloggers/Techie's are monetizing their website with Google ads.But as you know that Getting approved by google AdSense is very difficult due to their strict policies.Many bloggers are still struggling to get approved by Adsense. Even if Google approve's your site,then also there are many chances that your blog/website can ban by google due to their strict guidelines and Policy.If you break any rule or guidelines by adsense,they will ban you.Remember,Once Ban,they will never unban you and You have to forget AdSense. So Today in this post I am back with List of best and highest paying google AdSense alternatives. There are a lots of advertising network companies that give a Good amount of Revenue to their publisher.If you are the one who didn’t get his/her blog/website approved by Adsense or banned by Adsense, then you can surely try these below advertising networks. Infolinks is Best AdSense alternative and leading Intext advertising network mostly suitable for websites with high traffic. Infolinks converts certain keywords Of your website/blog content into advertising links and if someone clicks on such ads,you are paid for each click made on those ads. Many bloggers are getting good income with this program. If you have a good amount of traffic, you can make money with this program for sure.They provide several types of advertisement units such as Inframe,Inscreen,Infold,Intext, Intag,etc. Getting Blog approved by Info links is not a big deal.You can easily approve your blog by infolinks. Their Minimum payment threshold for Paypal and Bank transfer is $50 and 100$ for Western Union and wire transfer.Infolinks pays through various payment methods like Paypal, Western Union, Wire transfer and Bank. payment methods :- Paypal, Western Union, Wire transfer and Bank. Revenue hits is also one of the best AdSense alternative's in blogosphere. Revenue Hits is one of the best AdSense competitors, which was founded by MyAdWise Limited, an Israeli-based, start-up company started in 2008 by professionals to help you make more money from your website traffic. 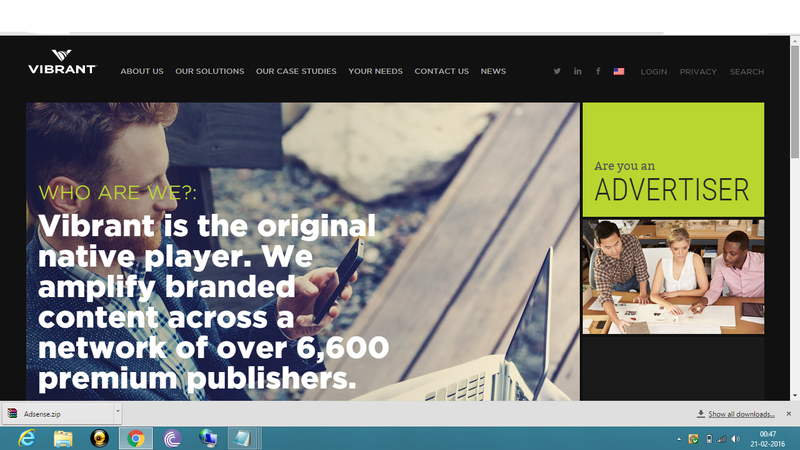 Revenue hits is a performance based advertising company where the advertiser pays for his product/website, when a visitor visits for each specified action such as buying their product,etc .They pay on via Wire,Paypal and Payonner. Their minimum payout threshold is just $20. Signing up new account is easy and free. Easy and quick tags set up is other advantage of using Revenue Hits. Revenue Hits activates your account instantly upon signing up while AdSense takes about 2-3weeks to activate. The best part about RevenueHits is that they provide open customer services for publishers and advertisers, where any webmaster can come and participate. Media.net,A contextual Ad network was developed by collaboration of yahoo and bing.It is similar As AdSense and shows ads as per the content.It is one of the biggest marketplace for advertisers to increase exposure of their online brand so you can easily make money by posting ads on your sites can give you a Decent income. If your blog/website gets good amount of traffic from USA, UK,Canada, and some European countries then you must definitely apply for media.net to earn good amount of money per month. The best part about Media.net is that they Give dedicated account managers and it's highly customizable(change the size, color and Banner type- Text or image). Media.net has a $100 minimum payout threshold.So After reaching minimum threshold, you can select any payment method Either PayPal or Wire transfer. It Provides customized ad units which Fits best with site. It also shows mobile friendly ads on mobile phone users.Currently, media.net is not opened for public sign up. But you can still request for an invitation. 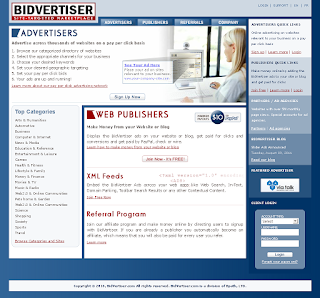 Bidvertiser is one of the great AdSense alternative That offers pay per click advertising. 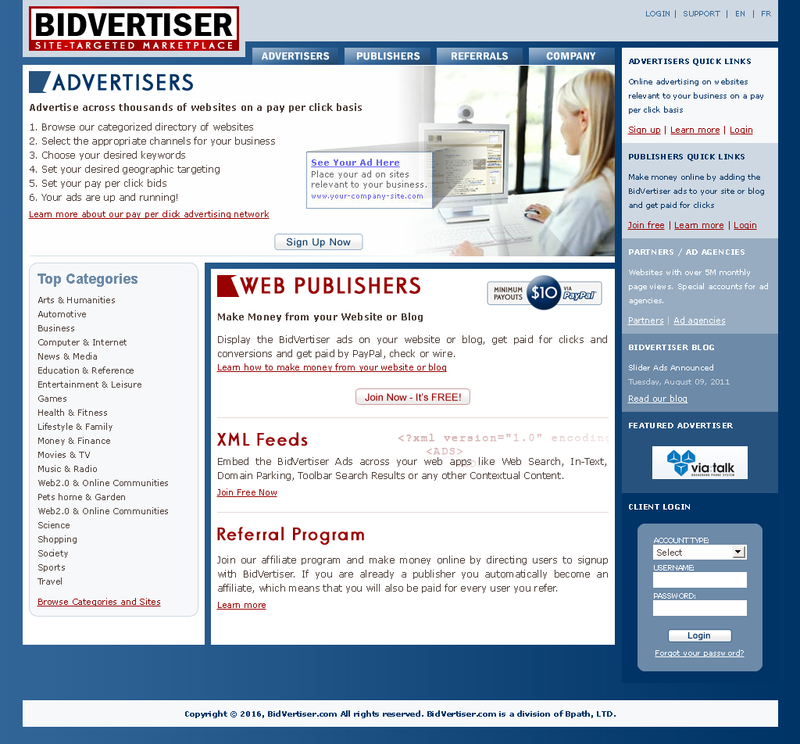 It is very easy to get approved by Bidvertiser, unless your website category is adult,drugs.It has a bidding system that allows highest bidder to advertise on your website/blog. Bidvertiser offers a toolbar in which you can create with your own logo. When users search through your website using the toolbar, they will be shown sponsored ads in the result section.Bidvertiser offers ad types such as Text ads, Banner ads,slider ads,mobile ads,etc. They support 4 types of ad formats: Banners, Rectangles and Mobile.Bidvertiser also offers a very smart referral program. Bidvertiser provides banner ads,text ads, Mobile Ads, etc.Also there are no traffic requirements, high traffic website will earn more money, especially if traffic is from countries like USA,Canada or UK.You can also earn money by promoting customized toolbar. It's Minimum payment threshold is $10 for PayPal/Payza and $50 for check. You can also promote your customized toolbar and make money. Minimum payment threshold amount is $10 for PayPal/Payza and $50 for cheque. Adversal is also one of the best Adsense alternative's. It is one of the ad program that asks for minimum of 50,000 page views per month on the blog. 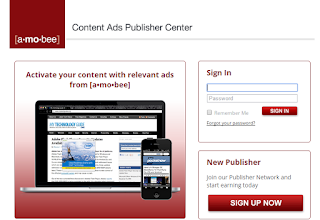 It is proved to be a Great Adsense alternative for many Bloggers. They provide Pop up and banner advertisments also and they provide very high CPM rates for Canada and Usa. Before submitting your application make sure that your website/blog get's at-least 50k page-views per month.They will generally approve your blog within 4-5 Days. Minimum payout is 20$ and payment Methods used are PayPal, ACH, wire. It Offers an affiliate program too. Chitika is another useful Google Adsense Alternatives similar to infolinks .Their ads looks similar to Google Adsense . In chitika you have full control on your ads and can use Chitika you have full control to use any other ad network like Google Adsense,Infolinks,etc.Just create an account on chitika and put ads on your site and Earn money. 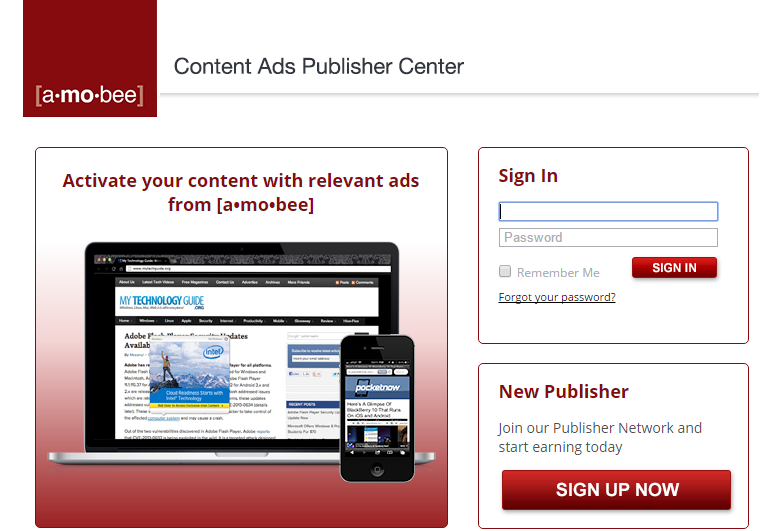 It offers 3 types of ads such as Local ads,Search Targeted Ads, and Mobile Ads. However many publishers claim that the rates aren’t as good as Adsense.There are various options to edit your ad color,text ,etc that enables you to fit chitika ads well with your blog's article. Minimum Payout: $10 via Paypal and $50 through Cheque. Kontera is one of the best Google Adsense Alternatives, that you can use for making money online.Similar to Infolinks, they also offers an Inline text advertising and show advertisements based on important relevant keywords related to your Article. It also offers various image and video ads. They pay as per click on their ads on your blog. Their Minimum payment threshold is $50 and payment modes are Paypal, Check and Wire at every 30 days. Just like RevenueHits, Qadabra is also a advertising network company that offers performance-based advertising.It is also one of the best alternatives to Adsense in the market. 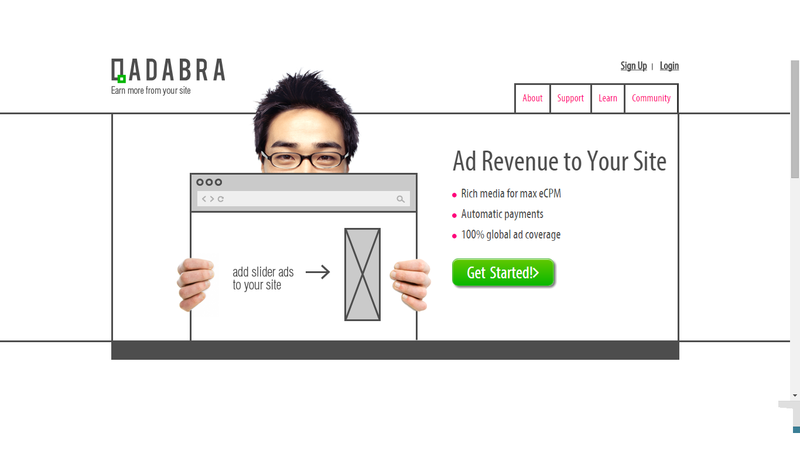 Qadabra offers several rich media ads which is something like Adsense cannot give.The main thing is that You don’t need to reach to a payment threshold.If you earn 1$,You can request your payment. Sign up with Qadabra and paste the ad tag on your site at appropriate location and now Qadabra starts optimizing your site to display the best ads. It offers banners including slider ads. You Don't need much content to get approved by Qadabra. Vibrant media is a advertising network company that focuses with highly targeted publishers.It is one of the best AdSense alternatives.But Getting vibrant media advertising is Tough due to their requirements.They have number of premium advertisers and they pay very high CPC rates to their publishers.If you want qualify their program, your blog/website must receive a minimum traffic of 500,000 unique visits per month.The main thing is that your traffic should be mainly from U.K,United States and Canada .Their minimum payment threshold is $50.You can redeem your earning's Via cheque. The offer various Contextual ad types such as corner Ad, margin Ad,Pop-under ads, inImage ads inVideo ads and many. Adsterra is a best adsense alternative for the websites that gets about 50K impressions per month. They accept website with all types of niches and have a great ad fill rate for all countries.Adsterra provides weekly payment systems. So These were the best Google Adsense Alternatives which I have recommended in the above article.But there are many such ads networking companies available in the market.Monetization is an important tool for bloggers because without it you cannot earn anything.I wish that you have understand that AdSense is not the end, there are also many AdSense alternatives by which you can make decent amount of money online and may be more than AdSense. Hope that you liked the post.Share it with your Friends because sharing is caring. Thanks For Your Sharing Your Valuable Comments with Us. Thanks for sharing this list of Google AdSense alternatives. I think it's important to join at least one alternative ad serving site when using Google AdSense. This gives you the ability to easily change out ads should there be any problems with your AdSense account. It also gives you the ability to test different ad formats and ad sources to help you determine the best network for your blog / website. I've personally used Infolinks, RevenueHits and Bidvertiser. I don't really like Bidvertiser's interface, but they have a great platform once you get past the interface. Out of the list you shared Adsterra, Qadabra and Kontera are all new to me. I'll be sure to visit them and see what they have to offer - I might even test out their ads on one of my blogs to see how they perform. Thanks again for sharing such great content! thanks Gerhard for the compliment. Great Post Preetam on Revenue hits which u wrote on your blog.Really informative post on Revenue hits.I hope that my users will love it.